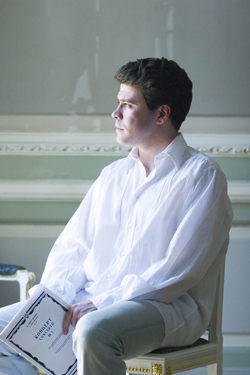 Denis Matsuev's stunning victory at the 11th Tchaikovsky Competition in 1998 launched a major international career for the young Siberian pianist. He has appeared in hundreds of recitals at major concert halls throughout the world, including Carnegie Hall, Lincoln Center, Kennedy Center, Théâtre des Champs Élysée, Mozarteum, Musikhalle, Musikverein, Royal Festival Hall, La Scala, and many more. Mr.Matsuev is Artistic Director of two festivals in Russia: Stars on Baikal in his native Irkutsk, and Crescendo in Moscow. In December 2007, his Crescendo Festival was introduced in Paris in artistic collaboration with conductor Yuri Temirkanov. For his concerto performances, Mr.Matsuev has appeared with some of the world's greatest orchestras and conductors, including the Mariinsky Theatre Orchestra/Valery Gergiev; Bayerischer Rundfunk/Mariss Jansons; St.Petersburg Philharmonic/Yuri Temirkanov; Baltimore Symphony/Roberto Abbado; Cincinnati Symphony/James DePreist; and Russian National Orchestra/Mikhail Pletnev. He records exclusively for RCA Red Seal/Sony BMG. Mr. Matsuev has given brilliant performances around the world with orchestras such as Chicago Symphony Orchestra, Houston Symphony Orchestra, Baltimore Symphony Orchestra, Cincinnati Symphony Orchestra, Symphonieorchester Bayerischen Rundfunks, Royal Scottish National Orchestra, Filharmonica della Scala, Leipzig Gewanhaus, Orchestre National de France, Orchestre National du Capitole de Toulouse, Orchestre Philharmonique de Radio France, Budapest Festival Orchestra and others. He is also continually engaged with the great Russian orchestras of his native motherland such as Saint-Petersburg Philharmonic Orchestra, Mariinsky Theatre Orchestra, Russian National Orchestra, Tchaikovsky Symphony Orchestra, National Philharmonic Orchestra of Russia, State Academic Symphony Orchestra of Russia, and Moscow Philharmonic Orchestra among others. Denis Matsuev regularly collaborates with the most prominent conductors on the stage today including Lorin Maazel, Yuri Temirkanov, Mikhail Pletnev, Valery Gergiev, Mariss Jansons Vladimir Fedoseyev, Leonard Slatkin, Vladimir Spivakov, Ivan Fischer. Mr. Matsuev is Artistic Director of two famous classical music festivals in Russia: "Stars on Baikal" in Irkutsk and famous "Crescendo" which is being held all over the World: Moscow, Sankt-Petersburg, Yekaterinburg, Tel-Aviv, Kaliningrad, Paris and Rome. These remarkable festivals feature gifted Russian soloists from all over the world with the best Russian orchestras and present a new generation of students from Russia's music schools. "Crescendo" festival had an incredible resonance in Russia and is under the patronage of the President of the Russian Federation.